Our Cyprus life. Since our first flight to Larnaca we couldn't get enough of the island. We returned over and over again whenever possible. We have visited every town, village and holiday resort. A few resorts such as Protaras didn't exist back then, now its a thriving fun filled family tourist resort. 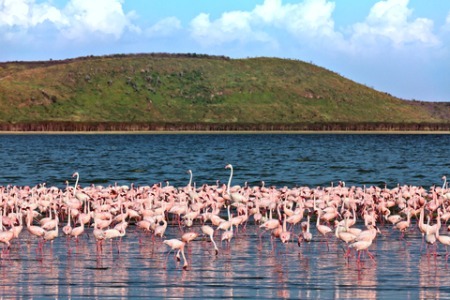 We stayed in countless hotels, spotlessly clean cheap accommodation and beautiful luxury hotels all over this historical and breath taking Mediterranean Island. From day one we fell in love with the most hospitable people in the world, their mouth watering cypriot food, abundance of history and beautiful scenery across this island endless blue skies and warm climate. We purchased our own home in Cyprus and moved 8 years ago and move to Cyprus Permanently 6 years ago. We became addicted to the relaxed lifestyle and the beautiful people. What defines Cyprus for us? 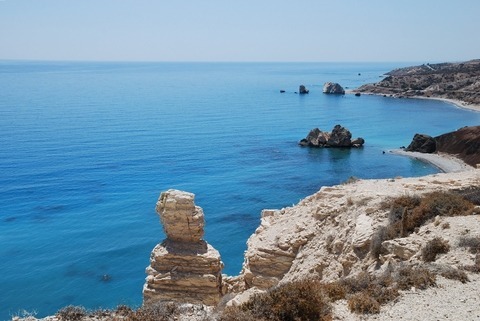 The warm Mediterranean sea, blue flag beaches, weather, delicious food and Cypriot hospitality everywhere! One of our favourite beaches in Cyprus is beautiful Nissi Beach right in the centre of Ayia Napa. Nissi is such a fun place, with boat trips, paragliding, watersports, the famous inflatable banana boat has been really popular for many years and the Pirates of the Caribbean Ship is great fun. 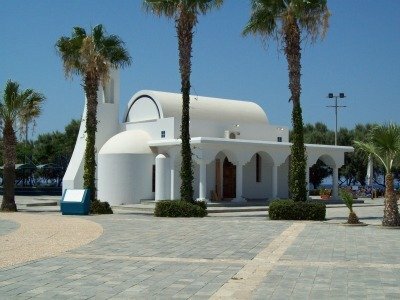 When we started our holiday adventures, Agia Napa was a much smaller resort and Nissi Beach had only one taverna close by. Now, affectionately calledNissi is world famous with many tavernas, restaurants, snack bars, nightclubs, pubs and festivals. We've seen it, done it, got lots of t-shirts!! We have great memories of Laranca. It is such an interesting mix of a busy resort with a long beach in the town centre, museums, historical buildings, business centre and huge diversity of shops. We had cloths made at a taylor's shop in Larnaca centre, shoes made to measure in a back street shoe shop, the most comfortable ever! There are fashion boutiques galore, high quality leather shops, we had leather jackets made to measure perfectly. That's why I call it lovable Larnaca. We toured Paphos resort, enjoyed the tourist area with many local cypriot tavernas, eating many cypriot mezes, with upto 30 dishes. Phew!! But lovely! Mythology says that Aphrodite was born from the waters at Paphos. Aphrodite's rock was the first place we visited, what a breathtaking site. We then visited all the historical and archaeological sites around Paphos. 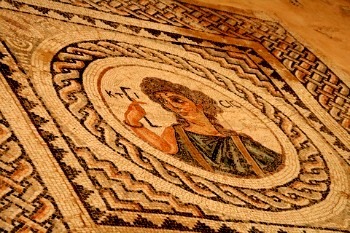 There are so many, Aphrodite baths, tomb of the Kings, the beautiful floor mosaics. Many times we have hired a 4x4 to explore Troodos Mountain, also called mount olympus. The beatiful winding scenic route is such a contrast to sea level. The climate at Troodos is a pleasant 5-6 degrees cooler with fresh mountain air. A pleasant retreat during 40c degrees at sea level. I would still love a summer retreat in one of the quint historic villages set into the mountains. 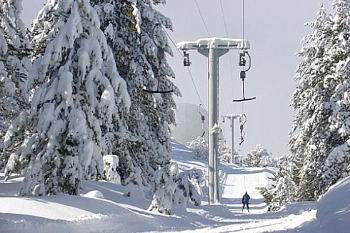 In winter, it snows at Troodos, many head up to go skiing. I haven't plucked up the courage yet! Get The Best Advise Ever, from us about Buying Property all from personal experience. See a sample of Property for sale by Owner who were confident about adviertising their Homes For Sale on our site. And... there's loads more fun and interesting things for you on the site. We hope you find something of interest to you. Visit regularly for updates, or better still... why not subscribe to our Cyprus Blog, it's free to join. You will get the latest new site pages or updates to the site before anyone else does. Just click on the Orange RSS Button at the bottom left of the Navigation Bar. If you don't know what RSS or Blog means, click on the ? beside the RSS button. Our site is dedicated to giving you the best information. I hope you will learn a lot from our Cyprus Travel and living experiences.